This impressive fountain was designed by Nicola Salvi and completed in 1762. It’s in front of Palazzo Poli and decorated with bas reliefs on heaps of rocks with statues. 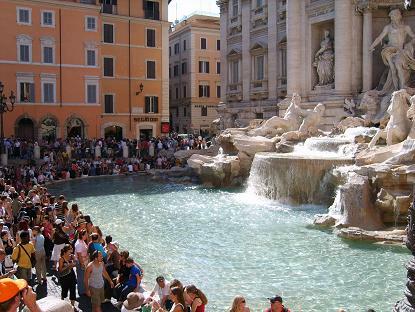 Many people will remember the fountain from Fellinis famous movie “La Dolce Vita” with Anita Ekberg. 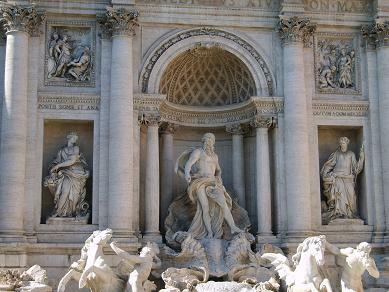 The central statue in the Trevi Fountain is Neptune riding a chariot pulled by two sea horses. Two Tritons are guiding those seahorses. Besides Neptune are the statues of Abundance (God of Wealth) and Salubrity (God of Health). The legend sais that who flips a coin over his left shoulder into the fountain, he/she will return to Rome. The fountain is near Via Del Corso and Via del Tritone. To the Spanish Steps is about 10 minutes walking. The Fontana Hotel is set in a 16th-century building right in front of the Trevi Fountain. Single-, double- and triplerooms. The Superior Double Room has views over the fountain.